The Hobart/Barr/Lucking Residence. Registered Historical Landmark No. 104—. This charming Colonial Revival residence was constructed between 1902 and 1905 and is an architecturally superlative example of the building styles characteristic of the transition from Victorian to Colonial during this time period. 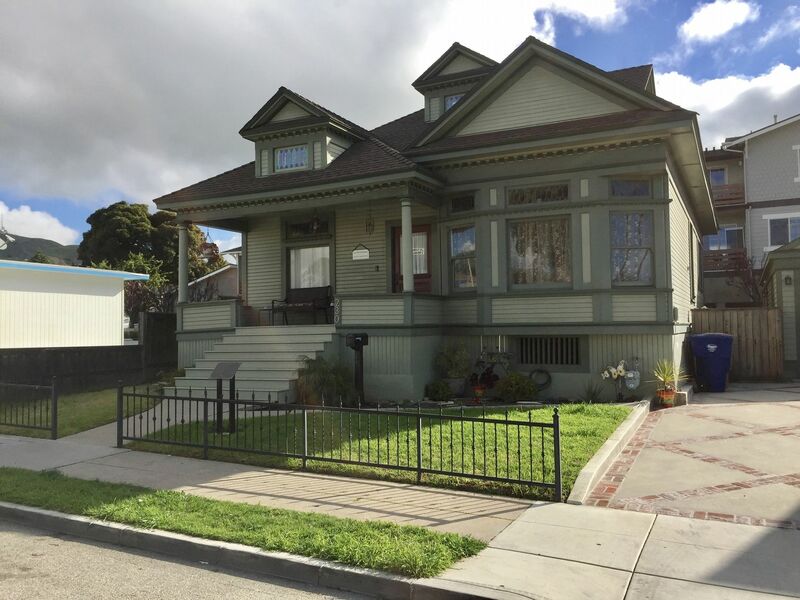 It is also representative of the very early development of the eastern addition of the City of SanBuenaventura during the city's "Second Land Boom" (1886-1905). The remarkable home was built by Captain Frank Hobart, prominent Ventura Justice of the Peace and his wife Julia, both of whom were very active in public affairs and were proponents of the Grand Army of the Republic of Union Veterans of the Civil War. The second significant resident, beginning in 1920, was Leonard Barr, longtime public servant, mayor and developer of a large part of residential Midtown Ventura. Catalina and Anacapa Streets were developed by Mr. Barr, who also built the elegant Hotel La Barr on Thompson Boulevard at California Street (demolished circa 1960). This charming Colonial Revival residence was constructed between 1902 and 1905 and is an architecturally superlative example of the building styles characteristic of the transition from Victorian to Colonial during this time period. It is also representative of the very early development of the eastern addition of the City of SanBuenaventura during the city's "Second Land Boom" (1886-1905). by noted local architect Bruce Labins, contractor George Walker and also by historian Cynthia Thompson, who facilitated their quest for landmark status. Bonnie Lucking meticulously researched and selected all of the extremely fine and period-correct surface details of this extraordinary house. 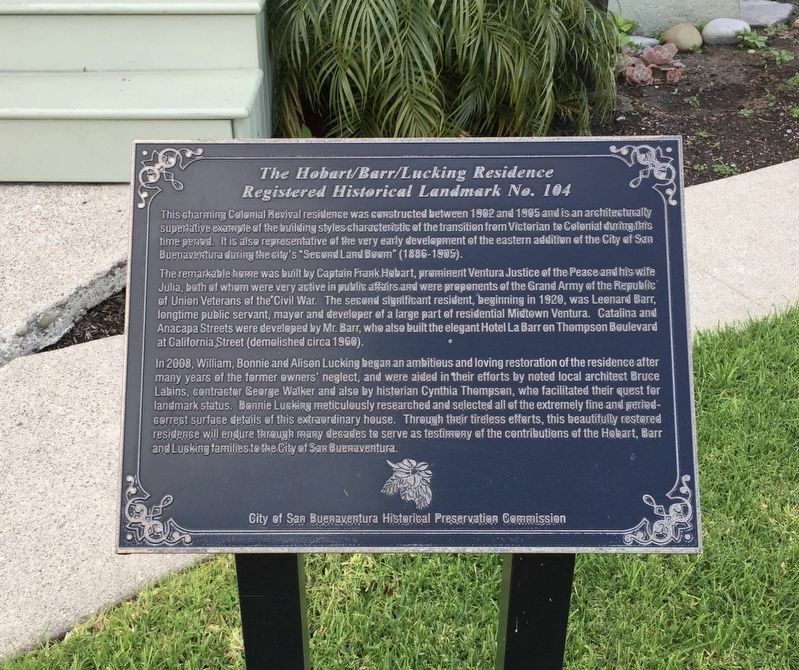 Through their tireless efforts, this beautifully restored residence will endure through many decades to serve as testimony of the contributions of the Hobart, Barr and Lucking families to the City of San Buenaventura. Location. 34° 16.671′ N, 119° 17.3′ W. Marker is in Ventura, California, in Ventura County. Marker is at the intersection of South Ash Street and East Thompson Boulevard, on the left when traveling south on South Ash Street. Touch for map. Marker is at or near this postal address: 230 South Ash Street, Ventura CA 93001, United States of America. Touch for directions. Other nearby markers. At least 8 other markers are within walking distance of this marker. The Hobart/Barr/Lucking Initial Residence c. 1898 (a few steps from this marker); Sifford House (about 300 feet away, measured in a direct line); 682 East Thompson Boulevard (about 600 feet away); Site of the Mayfair Theater, 1941-2000 (about 700 feet away); 632 E. Thompson Boulevard (approx. 0.2 miles away); Dacy Fazio House (approx. ¼ mile away); Ventura Theatre (approx. ¼ mile away); Groene Building (approx. ¼ mile away). Touch for a list and map of all markers in Ventura. More. Search the internet for The Hobart/Barr/Lucking Residence. Credits. This page was last revised on March 25, 2019. This page originally submitted on March 25, 2019, by Andrew Ruppenstein of Sacramento, California. This page has been viewed 43 times since then. Photos: 1, 2. submitted on March 25, 2019, by Andrew Ruppenstein of Sacramento, California.